Turned it on a couple of minutes before his first try! The tackle was probably the best bit. Toulon looked considerably sharper than they did last season. Good to see him make such an excellent start at his new 'home'. Pourquoi non Ash Le Splash? I note that 'Rugby News' tags each article line in the above link showing the rugby nation involved in the subject. The Ashton video is tagged with a South African flag. Grrrr! Fair play to him really surprised there was no ash splash on the intercept try though. Edited 1 time(s). Last edit at 28/08/2017 18:57 by GazzaFez. Try saving tackle...take note EJ! Absolutely gutted we couldn't hang on to this guy. England's loss by a mile not to mention Saracens! It looks as though someone trod on his bonce with their stilettos!! Smarting no doubt - scars of valour or annoying his wife? And then you open the other eye and remember that he couldn't be arsed to defend in the euro cup final build up to Abedanon's try. When Clermont broke down the left flank there were 2 defenders to cover the 2 attackers. Ash was placed to cover bendy. However the Clermont #6 was effective in his offload in that as well as passing to Bendy, he pushed the Sarries defender (Rhodes?) backwards to tangle up with Ash and stop him getting round. You watching the same try? Ashton doesn't tackle Spedding who makes the break opening up the field. He then lets Yato passed him and only makes a tackle once he's used Faz as a speed bump and has offloaded. Looked like a very good covering tackle to me. Head on I'd suggest both from Saints and Sarries that Ash isn't the best defender but chasing a player he's as good as any. Happy for him that he's had a great start to his new career. On a separate point tackling an opponent running straight at you is far more difficult than tackling an opponent from the side or from behind. There is considerably more force coming at you and the opponent has the best chance of spoiling your tackle with a hand off, sidestep or swerve. Players who are good at the former type of tackle usually have no difficulty with the latter types of tackle. The reverse is not necessarily true. Smaller, lighter men (or women) may have difficulty tackling a heavier, more powerful opponent running straight at them. Edited 2 time(s). Last edit at 30/08/2017 07:22 by Coughie. No one has mentioned or indeed alluded to this at all anywhere on this page, except you. Why on earth do people have to try and turn a thread praising the great start to the season for one of our ex-players into something it is not; I really don't understand the motivation of some people. Adey, I'm sure there are other Saracens players who made mistakes that day, so I would suspect that there are other things one of our most consistent detractors can focus on. I've noticed he tweets slot in French. Has Ashy got someone managing his account or can he actually 'do' francais? Good on him though, I've a real soft spot for him and am convinced he'll be back at AzP one day. Apparently not, Strets doesn't seem to have been in the ASM team - is he injured? Edited 1 time(s). Last edit at 04/09/2017 09:41 by Darraghgirl. Consider yourself slapped! Slight difference in body bulk but tackling isn't his forte - doesn't mean we can't praise him when he occasionally makes a good one. Edited 1 time(s). Last edit at 09/09/2017 22:06 by Darraghgirl. Interesting team selection - Ashy starts at full-back v Treviso! He's not enjoying himself. Just ha kick charged down and has incurred the wrath of Sir more than once. One of the narrower victories between poorly matched teams! Ashy update - spent first half marooned on the wing and didn't touch the ball (have his practical jokes upset all his team mates?) Went hunting for it like the old Ashy in the 2nd half, scored a superb try from his own half showing pace and a good ol' splash and another when Radradra reluctantly gave him the try-scoring pass. what a player radradra looks ! Sublime one-two with Tuisova (sp) for a try on 7 minutes. Playing 15 again. Not had his positioning tested yet. Ah, he has been found wanting both in positioning and tackling, but he finished the half with a fine try. 11th try of Chris today against Castres, but lost the game. Best scorer of the Top14. Not sure we had a choice. It was his decision, based on some very good reasoning about his treatment in England. I'm happy to have Sean Maitland and Liam Williams. It was also noticeable they talked about the French attitude that he might give 1 try away defensively, but score 2 - so comes out ahead. In England they would focus only on the negative and therefore not care how many tries were scored. I think I know why we didn’t play him at fullback - that was a shocker!! You MUST see what he has done on the second try of Bath (61°) !!! Ashtons 'kick' was dire of course but I would blame the stooooopid line out that put him there in the first place. Priestland kicking a penalty 'dead' was actually far worse. Thought Chris's tackling was fine. One of the most ridiculous tries I have ever seen! Toulon simply aren't that great anymore, Bath will be licking their lips for the home game. 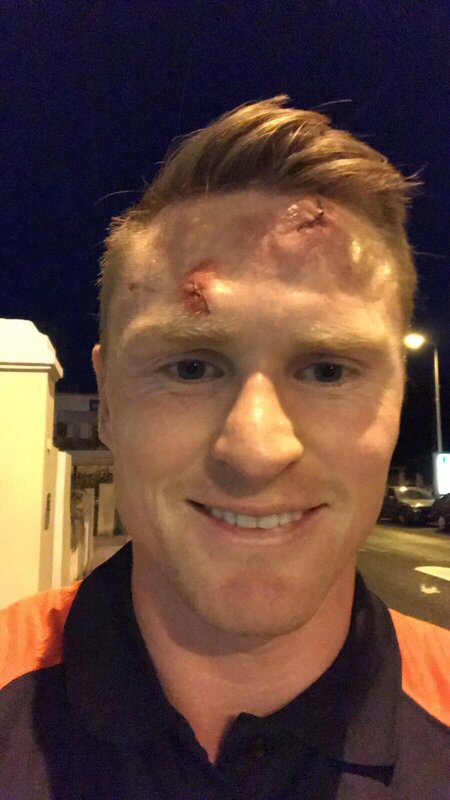 [b]Chris Ashton: Eddie Jones told me that my tackling wasn’t right. The former England wing, a player who has always polarised opinion, tells Alex Lowe that his move to Toulon has given him freedom from the stresses of playing in England. Tossing around a rugby ball as he strolls along the beach in Carqueiranne, a small resort just along the coast from Toulon towards Saint-Tropez, Chris Ashton is spotted by a few locals. One of the gentlemen applauds him, another mimics the “Ash splash”, his trade-mark try-scoring dive. The Toulon fans are growing to enjoy the sight of Ashton flying over the line. His move to the Top 14 has thus far been a success: 13 tries in 11 games and a new role at full back that is giving him a licence to roam and bringing out the best of his predatory instincts. Ashton is not about to go diving on to the rough, gravelly sand for them but he laughs and acknowledges the locals with a wave and a polite “bonjour”. He is starting to get recognised in these parts, where the rugby club is the beating heart of the community. “Even the Spar is a club partner,” Ashton says as he walks back past the marina, pointing to the local convenience store with a club badge in the window. On the black-and-red ball that Ashton is spinning in his hands is printed the Toulon motto: “Ici, tout est différent”. For Ashton, that was the attraction of making a fresh start on the Côte d’Azur. Everything here is different. Ashton, his wife Melissa, their daughter Ava and their dog live in Matt Giteau’s old house, which sits secluded at the top of a steep, jagged track and looks out on the Mediterranean. It feels a long way from Harpenden, in Hertfordshire, as the sunset casts a pink hue over the sky and the sea. Ashton brews a coffee and settles down to explain, for the first time since joining Toulon, the full story of how he ended up being here. It is a tale that has its roots in 2014, when he was first dropped from the England team by Stuart Lancaster, and is not short on controversy. It all came to a head in 2016, a turbulent year in which Ashton was banned twice for a total of 23 weeks, turned his back on England and became a father. Having been frozen out of the England picture by Lancaster, Ashton began 2016 by winning a recall with a place in Eddie Jones’s first squad. But the day before he was due in camp to begin preparations for the Six Nations, Ashton was cited for making contact with the eyes of Luke Marshall, the Ulster centre. There was a strong body of opinion that Ashton had been careless at worst but the disciplinary panel hit him with a ten-week ban. Knockback No 1. Ashton came roaring back into form, scoring ten tries in eight matches as Saracens reached the Aviva Premiership final. “I’m man-of-the match in the semi-final and the phone rings. It was Jones. I was like, ‘Right, a bit of good news.’ Then I get told I’m not going on the tour [to Australia].” Knockback No 2. “I was told I was in the Saxons squad. My heart just dropped. He said to me my tackle completion wasn’t right — but at Saracens you make a tackle and get out as quickly as you can so you can get set again. “Everyone I spoke to said, ‘Go [on the tour]’ and that it was a test. Everyone. Maybe it was a test and I failed dramatically. Melissa was pregnant. She had been pregnant before and lost it. It was getting close to the birth and I didn’t really want to go on tour to try to prove myself. I didn’t really feel I needed to. Even after turning down the Saxons tour, the “positive” communication with Jones continued until Ashton was banned again at the start of the new season, this time a 13-week suspension for biting Alex Waller. Ashton argued that the teeth marks were caused by the force of Waller’s arm going into his mouth but the disciplinary panel concluded the bite was deliberate. Knockback No 3. The final straw. Ashton repaid Saracens handsomely last season, scoring the last of his club-record 76 tries in the European Champions Cup final victory over Clermont Auvergne, after which Richard Barrington performed a special rap as part of the team’s victory celebrations. Ashton’s haul of 37 tries in 57 Champions Cup games is a record, yet he has always divided opinion. Some dislike the showboating and on-field antics, but the class clown persona has always belied a fierce desire and strong work ethic. There have been silly moments along the way which do not endear him to people, such as the occasion he shouted “push it” as Nick Evans lined up a kick. But those who know him closely believe him to be misunderstood. Last month, after Toulon had lost away to Agen, he stopped for every selfie request before leaving the field. Ashton has learnt how to deal with the roller-coaster of emotions in sport, but he was upset recently when Manu Tuilagi appeared on BT Sport and stuck a picture of him on a punch bag. Six years ago, the police asked Ashton whether he wanted to press charges against Tuilagi for punching him in the head during an East Midlands derby. He did not. They were England team-mates and went to the World Cup together, but their relationship was never the same. “I am the first one to have a joke and a laugh,” he says. “But when Manu put the picture back on and said ‘I want to punch his face’ I was like, hang on, maybe there is something in it.”There is more to be said on the subject of Tuilagi but Ashton decides to leave it in the past. The immediate future is back-to-back Champions Cup games against Bath. Toulon began their campaign with stuttering one-point victories over the Scarlets and Benetton, but Ashton feels they are beginning to click into gear under Fabien Galthié. Last weekend, they thumped Lyons 39-11, with Ashton scoring twice. He has seven tries in four games since moving to full back and is forming quite a back three combination with Semi Radradra and Josua Tuisova. He has to keep reminding himself not to compare Toulon’s ways with those that he was so used to at Saracens. The two clubs could not be more different. The training is nowhere near as intense with Toulon, nor are the bonds as tight. Melissa is planning to invite other wives and girlfriends around for a coffee morning. Ashton listens as he strolls along the sand to comments made recently by Kevin Pietersen, who described a sense of freedom now that he has been able to leave England in the past. Ashton can relate to that sentiment. Living in this idyllic corner of France, he no longer feels weighed down by the baggage of England and the “constant stress” that accompanied it. The local gentleman who is pretending to pass him a rugby ball has no interest in anything other than how Ashton plays for Toulon. “Maybe I would have played for England again, maybe I wouldn’t. It doesn’t matter. I’m glad I can forget about it,” he says. “You play in England and there is always a group of people who think, ‘He’s not good enough to play for England.’ Here you don’t have that. “Why be in England and be surrounded by it all the time, when I can be here and away from it all? It’s what I wanted. If I do well here at Toulon, the team and the fans are more than happy.” Everything here is different indeed.